I'm excited to announce that TM-Town is now integrated into the recently released CafeTran Espresso 2015 CAT tool. 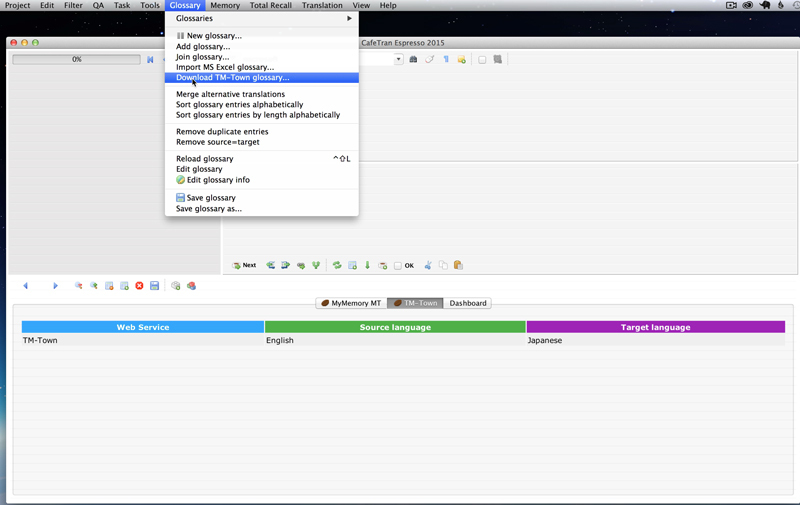 Translators can search and download TM-Town terminology repositories directly within CafeTran. This is just a first step and I am working with Igor from CafeTran to make it possible to easily leverage your TM-Town files from directly within CafeTran, so expect more features and tighter integration with your TM-Town account in the near future. This is a first baby step in my plans to ultimately make TM-Town seamlessly integrated into all of the popular CAT tools. If you want to try out this new feature be sure to sign up for TM-Town - it is free to register. Spain Posted over 3 years ago. Hello - I tried to link my CafeTrans account with TM-Town, but the authorization pane where I should input my TM-Town account details comes up blank on my screen. Could this be a Mac vs. Windows issue? - your video above shows the Mac version which looks different to my Windows version. Thanks for your comment and sorry to hear you had trouble setting it up. Could you also please bring this up on the CafeTran forums. Here is a link to the TM-Town portion of the CafeTran forums. This way Igor from CafeTran can see it and help us to investigate the issue further.